The Oscillator screen of the Virus Indigo TDM plug-in — a familiar sight to anyone acquainted with the old Virus TDM, or indeed the hardware synth. There are plenty of modern digital synths around that are claimed to provide authentic analogue sounds, and there's plenty of debate over whether any of them actually succeed. The Access Virus was among the first 'virtual analogues', and has gone through a number of incarnations over the years. Originally a desktop module, it's since sprouted keyboards of varying dimensions, been shoehorned into a 1U rack, and painted any number of different colours. It's also been stuffed onto a CD-ROM and sold as a TDM plug-in for Mac and PC Pro Tools systems. And for all the arguments about whether the Virus really captures the analogue 'sound', there can be no question about the authenticity of its recreation in software. Digidesign's TDM cards use the same Motorola DSP chips as the hardware Virus, and the code behind the sound engine that runs on them is the same in each case. Indeed, if you happen to own a hardware Virus as well, you can transfer patches between the two, and use the knobs on the hardware version to manipulate the plug-in's controls. If you want to know what the Virus sounds like, or learn about its synth spec, I suggest consulting previous SOS reviews of the hardware units (for example, the review of the latest hardware Virus, the Virus C, in SOS August 2002, and the latest review of the Virus Indigo, in SOS October 2002). The various upgrades that the hardware Viruses have received over the years have been more than cosmetic: new features and effects have been added in software updates — v6.0 of the Virus OS has been available since May — while the internal synth hardware is now on revision C. Until now, however, the TDM version has missed out on these improvements. The new Virus Indigo plug-in brings the software incarnation up to date with the latest hardware Viruses, and boasts more than 30 new functions and synthesis parameters compared to the original, along with a redesigned interface and support for Digidesign's new HD hardware, on which it will now work at sample rates up to 96kHz. Users of the software version are, however, still second-class citizens in the manual department, getting their documentation only in PDF format. One aspect of the Virus plug-in that can be confusing at first is the design's way of maximising DSP resources. Once you've installed Virus Indigo, it appears within Pro Tools as eight separate plug-ins numbered Indigo 1 to Indigo 8, each available in mono, mono-to-stereo, multi-mono and stereo versions. Instances with the same number share a Mix or HD DSP chip, and appear in the MIDI Device/Channel Selector as Indigo 1a, Indigo 1b and so on. A Mix or HD DSP chip can host up to eight instances with the same number, each playing back a different patch, so you could theoretically create a 64-part multitimbral synth if you had eight DSP chips to play with. Maximum total polyphony from one DSP is 16 on a Mix system or 20 on an HD card. Heavy use of Virus Indigo's effects can bring down polyphony, but to my mind, built-in effects are much less useful anyway on a software synth than they are on a hardware device. The system takes a little bit of getting used to, but works very well in practice, and gives you a flexible way of managing your DSP resources. You could, for instance, use one DSP chip to play back eight different monophonic parts such as snares and basses, and another for a single 16-voice organ or piano patch. Virus Indigo is certainly more DSP-efficient than its only major rival on the TDM platform, McDSP's Synthesizer One, which can deliver seven voices from a Mix card DSP and eight from an HD one. The first difference you're likely to notice between the old and new Virus plug-ins concerns the copy protection. The original used the then-standard floppy key, whereas Virus Indigo comes with a licence card for authorising an iLok dongle. If you had the original Virus plug-in installed on your system, Virus Indigo overwrites it, so you might as well uninstall the original and save your authorisation, in case you want to install it on another system. Having discovered this, I was a little nervous about what would happen when I loaded in a Pro Tools session that had used the old Virus plug-in — especially as I often don't bother to save its settings as a Virus patch, finding it simpler just to save the entire Pro Tools Session. I needn't have worried. The Session loaded without any problems, and with Virus Indigo automatically loaded in the inserts where the old version had been. When I pressed Play, everything sounded exactly as it had done before. Top marks (although a Readme file supplied with Virus Indigo warns that this may not work properly on the PC). Opening the plug-in's editing window highlights another change: the new Easy Page. Since the Virus has far more parameters than can comfortably be accommodated in a plug-in window at once, they've always been divided into six thematically arranged pages: Osc, Filter/Env, LFO, EFX, Misc and ModMatrix. The point of the Easy Page is to provide instant access to 10 of the most important parameters from across the range, so that you can do 'quick-and-dirty' edits without having to jump around the pages looking for the right parameter. 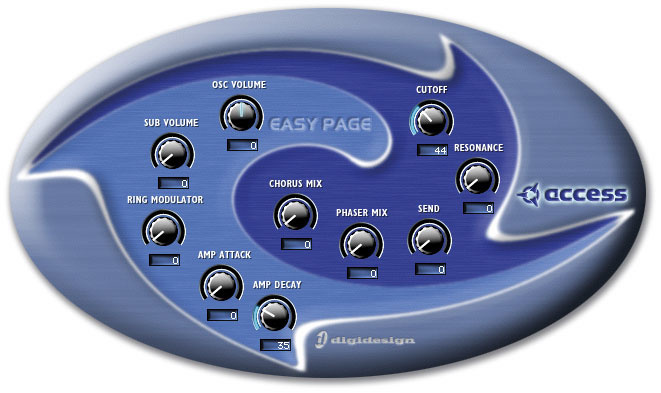 Some of the Easy Page controls actually manipulate several parameters elsewhere; for instance, the Easy Page Filter Cutoff knob adjusts the cutoff frequency of both of Virus Indigo's filters together. New parameters have been added to most of the individual editing pages, and the Misc page is now known as FX2/Global. The new Easy Screen provides a quick way of getting to some of the main sound-generating parameters.The Easy Page is a nice addition, but for anyone familiar with the basics of subtractive synthesis, the detailed editing pages shouldn't be too daunting. The interface is actually superior to that of the hardware synth in one respect, because there are no shifted functions — every parameter has its own dedicated control. However, Access haven't done too much to exploit the additional potential for visual feedback offered by a full-sized computer screen. For instance, the Wave Select and Shape controls for each oscillator allow you to choose a waveform from a preset list of 64, and then shape it to taste. This feature would be so much more intuitive if you could actually see a visual representation of the waveform change shape as you move the controls; in fact, you can only find out what wave shape any number corresponds to by looking it up in the PDF manual. Likewise, there's no graphic display of envelope shape, and I also think it's a shame that virtually all Virus Indigo's parameters are still calibrated arbitrarily from 0 to 127, or -64 to +63. How about giving us values in seconds, Hertz and other real-world units? Minor gripes aside, however, Virus Indigo's interface is a model of clarity, and is easy to use. Like any good plug-in, moreover, it allows almost every parameter to be automated with a minimum of fuss. To my mind, this facility more than makes up for the lack of physical controllers to play with, and I often find myself drawing in automation curves for half-a-dozen Virus parameters or more. Setting Virus up as a vocoder, or using its filters to process another audio track in Pro Tools, is also trivially easy. 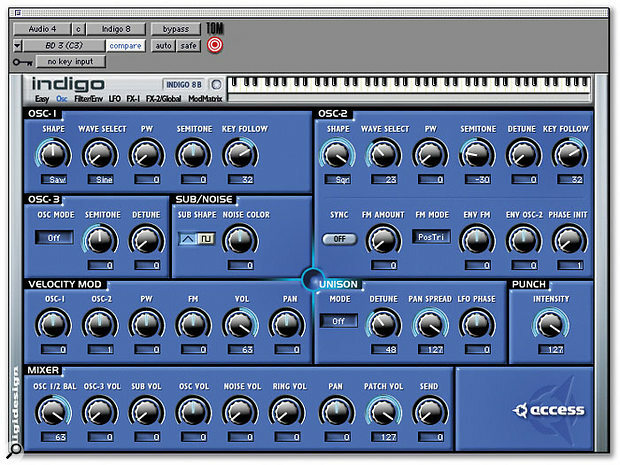 The Virus Indigo plug-in is one of those products that does pretty much what it says on the tin. It is an Access Virus synth in software, and its integration into Pro Tools is exemplary, particularly with regard to its handling of DSP resources (see 'Voice Management' box below). In a 44.1kHz Session, Pro Tools reported Indigo as taking a mere 384 samples to do its thing. Add that to the laughably low latency of the Mix or HD hardware, and you get a number small enough for Virus Indigo to be indistinguishable from a hardware synth in terms of its responsiveness to keyboard input. It feels like the real thing and it sounds like the real thing. Pro Tools TDM and HD users have always been able to call upon a wide range of high-quality plug-in effects that have not been available to users of native systems. When it comes to synths, however, the situation is reversed, and it would be easy for TDM users to become jealous of what's available on native platforms. For anyone in this position, I recommend a course of Virus Indigo. It doesn't just sound like a Virus. It is one. Makes efficient and flexible use of DSP resources. Seamlessly replaces old Virus TDM in Pro Tools Sessions. Some other software-synth interfaces provide better visual feedback by not sticking so closely to the hardware paradigm. 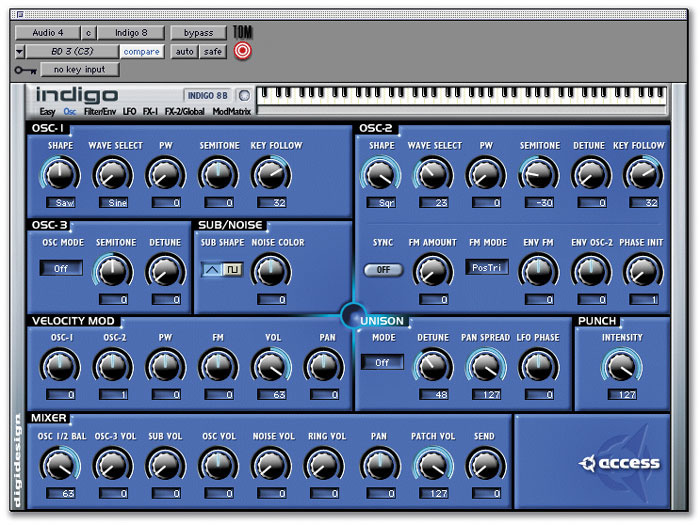 The Access Virus is perhaps the most popular analogue-modelling synth around, and Virus Indigo TDM is a worthwhile update to the already excellent software implementation.